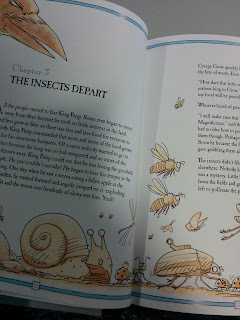 The book frames the game within a fairytale narrative- A just and beloved leader, who was very into produce and insects and biodiversity generally has just died, leaving his foolish, selfish and greedy son in charge of the kingdom. Under his rule, the crops wither, the people go hungry and the essential pollinating micro-beasts leave the kingdom for more fertile climes. 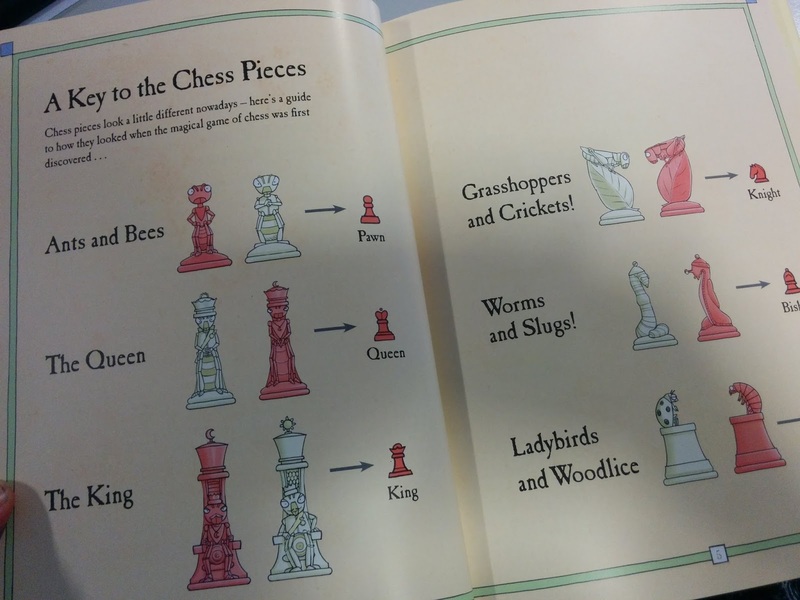 It is up to the Royal Gardener's kids, Holly and Pip, to pursue the fleeing insects to their forbidden underground world, master the game that they play to keep their insect society in order and bring the essential invertebrates back to the kingdom. 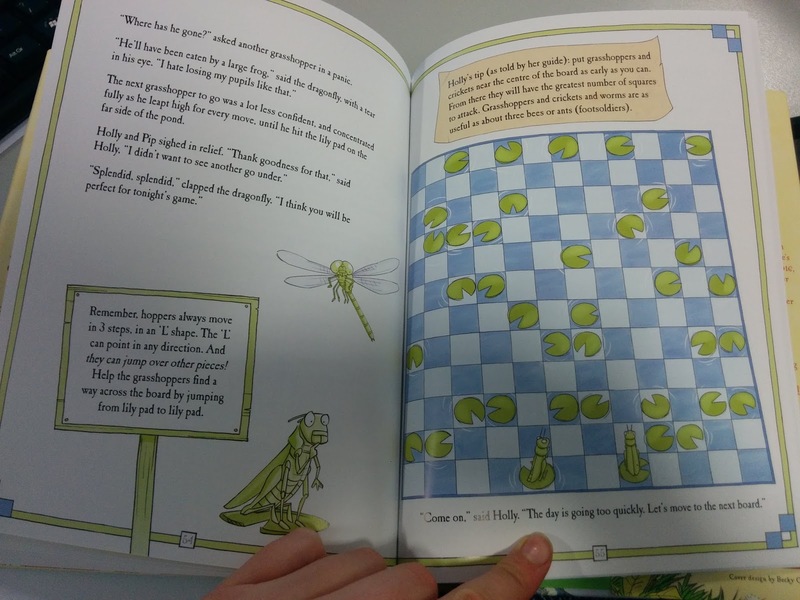 Once hidden in the insect world, Pip and Holly witness a game played out between the daytime insects and the nighttime insects, in lieu of actual battle. 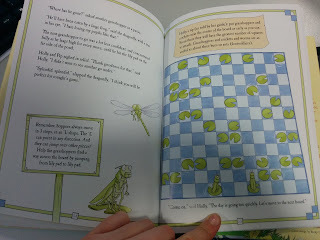 It is a complex game, with lots of specific moves and maneuvers, and some of the insects end up in a kind of prison..
Pip and Holly learn the rules of this game, traversing several training grounds to learn the rules and moves of each piece. Here the Grasshoppers and Crickets are fulfilling the roles of Knights, hopping in L-Shapes around lily pads. 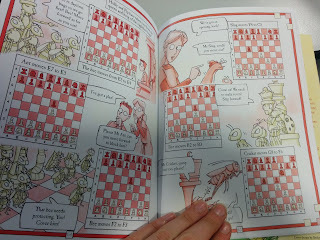 The instruction ends with an illustrated, step by step game played out in stages, with each of the moved explained and justified. It's a novel idea- something that I think will work very well alongside the app, which will hopefully offer a real-time animation of each move and provide puzzles and scenarios to solve. Where the book could spark interest in the game, the app may take the actual skills of the player further until they are brave enough to battle the board for themselves. I liked how the game was framed within a fairytale narrative, but I did get a bit lost with which insects were what pieces and had to keep checking back to make sure! The story is fun and engaging, with a nice additional message about the importance of biodiversity...The illustrations are excellent, Martin Brown's brilliant and familiar wide-eyed and characterful figures jump off the page, bringing an otherwise quite obscure game to a new audience- the instructions are manageable and introduced at a pace that is not overwhelming, and examples of all the moves are included. 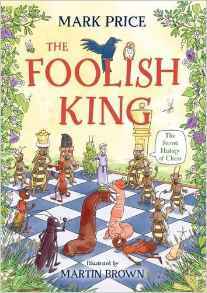 An interesting and unusual mixture of fiction and non fiction! 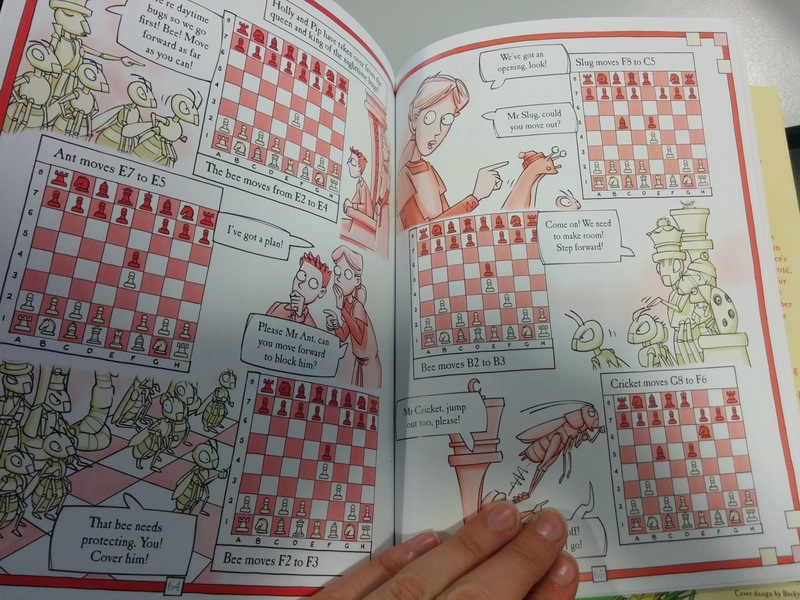 Unfortunately I can't say as I will be taking up chess though- as a terrible tactician and reckless player of most games, it is simply too tactical for me!